and enjoy it on your IPOD, IPAD, Blackberry, mp3 player, or whatever medium that fits in your purse, pocket, or bag or shirt sleeve. You absolutely can't go wrong there. 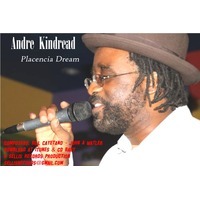 Meet Andre Kindread - raised in Guyana, South America. Andre spent his early life immersed in the culture that has given the world reggae and soca, steel band, Rastafari, rice and peas and much, much more. Self trained as a singer and percussionist, Andre began acting and singing in High School but didn't pursue it. Years later, he was studying Behavioral Science at Cal Poly Pomona, when he was asked to audition for friends of friends who were in a reggae band in Claremont, CA. The rest, as they say, is history. Based in California's Inland Empire outside Los Angeles since the early 1990s, Kindread has been pivotal in creating and maintaining the presence of Caribbean music in the area. First with Bass Culture, then with Kindread, and then Jah Sekou and now Full Wattz. Kindread has used his lyricism, unique vocal, dynamics renditions of reggae classics, and a charismatic stage presence to bring the Caribbean experience to energized crowds all over Southern California and neighboring states. His show has been described as exciting, energetic, spiritually uplifting, authentic and his voice as sultry, smoky and fun-inspiring!!! As well as a long tenure on the famous Reggae Boat in fabulous Long Beach, Kindread has brought his magic to local and regional venues, corporate and private events, and has graced the stage at city concerts in cities including Alhambra, Brea, Hermosa Beach, Monrovia, Ontario, San Gabriel, Signal Hill and Universal City's Citywalk, as well as a stint at Disney's California Adventure Amusement Park. Andre Kindread's stimulating and danceable music breaks down barriers of age, culture and class as he sings the message of One Love and Unity.